I’ve been thinking lately about just how lazy I have been about updating this blog. Many reasons occur, none of them able to stand up to any real scrutiny. Then, like an arrow from the Muse, I get my bi-weekly Bike Bits newsletter from Adventure Cycling. Lightbulb; each issue they begin with a cycling-related quote. So will I do also, and see where it leads me. Therefore, this view from the seat of my bicycle. Roxie was the fastest dog that my husband and I have ever had. Tom swore she was part greyhound, and not just because she could run. Billed as a full-blooded Labrador when we got her as a pup, she grew up a long-legged beauty with absolutely no use for her nose. You know how, if you’re riding in the car with your retriever, and you roll down the window-even a little bit-the dog will be in Heaven? Not our girl. She insisted on sticking her head right between us, peering out the windshield, intent on whatever it was she thought we were chasing. You couldn’t make her lie down in the back; you would think she was lying on a bed of nails, whining and yipping and generally embodying misery, her own and ours. But boy, did she like to run. Did I mention she could really run? So, the quote above really brought back memories. 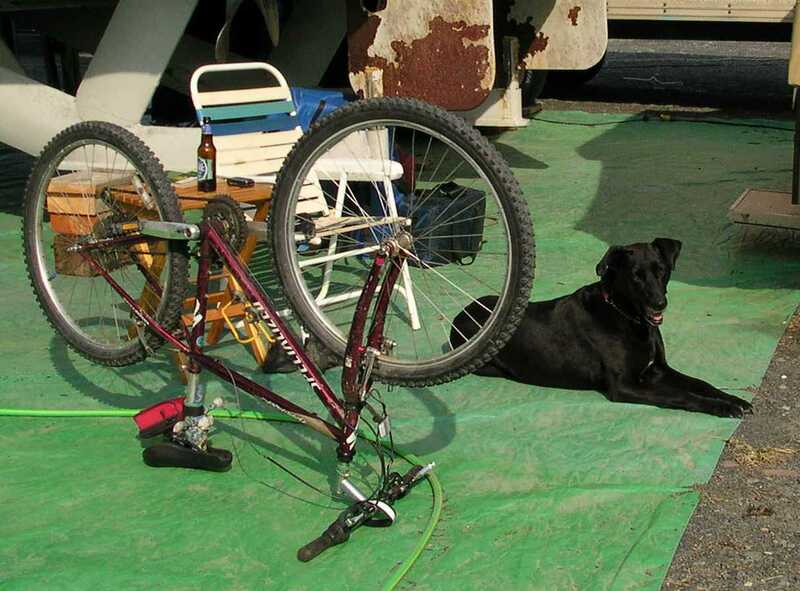 I started taking Roxie out with me on the bike path in Valdez when she was just less than a year old. She was far too young to run with the bike, especially since I always wanted to ride the whole 14-mile round trip. So instead, I donned my in-line skates, and away we went. At first she was on the leash-after all, she was young, and not completely voice-trained yet. I worried that she’d be forever tripping me up, questing back and forth across the path, following her nose. She soon proved that was simply not in her repertoire. And she was very smart-it took only one instance of rolling over her toes before she kept completely out of my way. When I finally felt she was ready to accompany me on the bike, I bought one of those spring-loaded leash holders, the kind that mounts on the seat post or chainstay. Mistake. Have I mentioned that Tom taught her to skijor the winter before? First time out on the bike she must have thought we were just going on a faster, warmer pulling adventure. We both did some major freaking out. All told, we fared much better with a length of rope; I could steer with one hand and hold the rope in the other, and she learned not to get too far ahead. As I said, smart girl. With both the skates and the bike Roxie and I eventually graduated to untethered travel. Man, would we fly down the bike path, both of us grinning, the wind in our ears and our tongues lolling! She kept one eye out, getting to the other side of the path when I pointed, heeling when we encountered other traffic and blasting through the ponds and wet spots along the entire length of the trail. She was a tireless and uncomplaining companion, a treasured playmate when I went solo on the trail. We’d ride the out-and-back in about an hour. Once home, after a drink of water and a quick nap she’d be back at the door, begging for a repeat. Boy did she like to run. Mandy & Tom, where are you? Haven’t heard in ages. As for Roxie, some labs just aren’t labs, but they are still great dogs? Great Story and thanx! ! ! Glad you liked it! When are you coming for a visit back to Alaska? Hi…Maybe this summer! Been a long time between drinks! ! ! Plan still not completely jelled, but will keep you guys in the loop. Later. . .Jer ‘n Kat. . .
Good deal, keep us informed. I’m still working, but Tom is retired and loving it. We’d love to see you! Nicole, yes I did see this in Bike Bits–very interesting. My biking partner and I have talked for a while about coming to NM to do some biking–we both live in Alaska. In fact, you might like her blog also, Sharry Miller on typepad.com. She’s really an outdoor woman! I actually was just in NM in January. My husband and I drove a little old sports car from FL across the southern tier, visiting friends and relatives along the way, to Indio CA. We stopped in Albuquerque for almost a week, though we had not brought our bikes and so did no cycling. Next time I’m there I will definitely look you up! And maybe Sharry and I will get up the gumption to come to New Mexico for a self-guided tour–especially if we can draw on your expertise!